Why should you choose a Sangre booth? Manufactured from powder coated mild steel panels or stainless steel panels for durability and good powder release. Superior powder collection maximises powder recovery. Designed for rapid colour change. Over 35 years of manufacturing experience. Manual or powered roll on/roll off available. 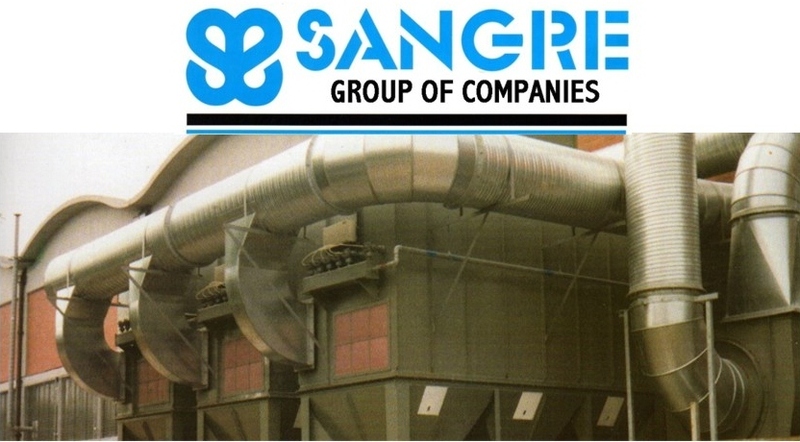 Why should you choose Sangre recovery equipment? Range of high efficiency quick colour change mono and twin cyclones, with air volumes between 850 m3/hr to 24,000 m3/hr. Colour change ductwork between booth and cyclone inlet. Range of Auto Shake After Filters using the latest anti-static polyester filter media. Ideal for manual and small automatic booths. Air volumes between 1,000 m3/hr to 18,000 m3/hr. Range of Cartridge After Filters using the latest anti-static polyester filter media technology. Air volumes between 1,700 m3/hr and 25,000 m3/hr. Available with pulse jet or swing wing cleaning systems. Can be close coupled onto booth to become intregal part of powder coating booth. Ideal for automatic booths when compact design is required. Over 35 years manufacturing experience. Automatic recycling of recovered powder from cyclone bins and cartridge after filters available. All Prices On our price lists do not include Delivery or Vat these are to be added at current vat rates . Delivery/carriage can be arranged at an extra cost. For more details see TurbAway High Efficiency Cyclones, DustAway Auto Shake Filter Units & Cf Cartridge Filter Units.